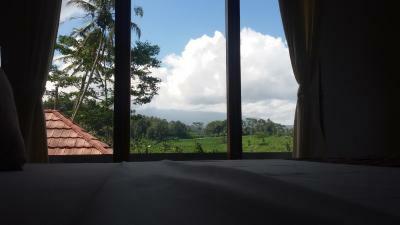 Lock in a great price for Bukit Luah Sidemen – rated 9.5 by recent guests! The place were far off the city which we most certainly like. The view was astounding, especially during mornings. I wish we could have stayed longer. 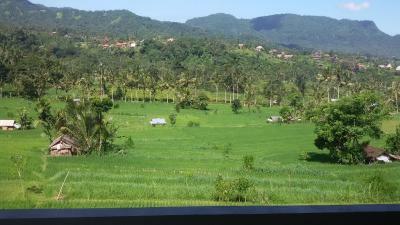 The room was spacious, clean and had a beautiful view to the rice field. It is very quiet and peaceful. 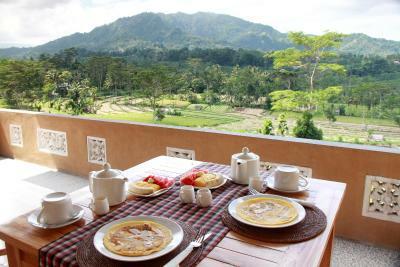 The breakfast was also delicious with pancake and fresh fruit and coffee. There are also other choices for breakfast but pancake is my favourite. The owner is very friendly and helpful, always there if you need something for help. Magic place! 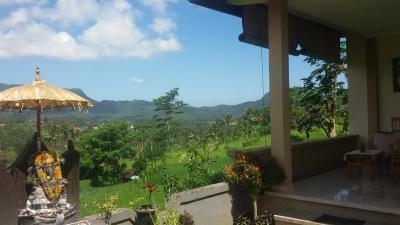 The best view in Sidemen, from your private terrace. Good location, friendly locals. Highly recommended. Very friendly and helpful staff! 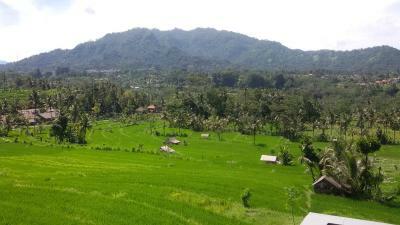 It's an amazing place: it's super clean, quiet and with a breathtaking view over the rice fields. The bed is comfortable and clean. The staff and owner are kind and always happy to chat. They are excellent cooks! Traditional breakfast is delicious. Maybe the best place I've ever stayed at. The staff were all incredibly friendly and dedicated to making sure I had a good stay. The view from the room is breathtaking. Every breakfast I had was delicious, as well as the lunches and dinners with you can order to your room at cheap prices. If you're going to Sidemen do not miss this place. Wish I had stayed longer. EVERYTHING WAS PERFECT. I would like to rate this more than 10 if possible. 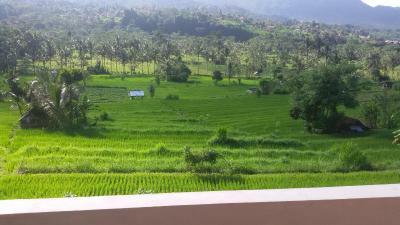 Me and my husband stayed at the upper room for honeymoon and felt so bored to go outside, just chilled at the terrace to view the magnificent rice terrace and the sound of the bird. Far from the hustle and bustle of the city. The view was SPECTACULAR. The staff was very kind. The breakfast was absolutely delicious. Really recommend this to others if you want to have a romantic gateway and far from the city. 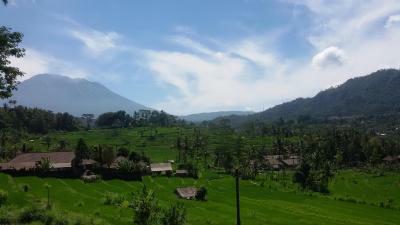 Stunning view from the room windows and room balcony towards Mount Agung and beautiful valley. Komang who takes care of everything is a great cook and was such a great host. Very comfortable and clean bedroom, we had breakfast and dinner on the balcony and loved it so much. There's a wide range of breakfast options you cab choose from, which is a real plus. It's located in a little town called Luah, 10 minutes away from Sidemen with motorbike, and away from where all the Sidemen hotels and restaurants are concentrated, which we like a lot. I recommend this place A LOT. Amazing place, spacious, very clean, great staff and good food. The view from our terrace was just spectacular, as if we were walking into a painting. We wanted to stay for 3 nights but ended up staying 7. Very well recommended! Bukit Luah Sidemen This rating is a reflection of how the property compares to the industry standard when it comes to price, facilities and services available. It's based on a self-evaluation by the property. Use this rating to help choose your stay! One of our best sellers in Sidemen! 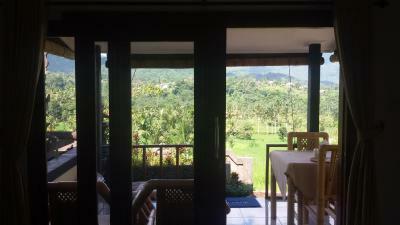 Located in Sidemen, Bukit Luah Sidemen offers 1-star accommodations with a garden. 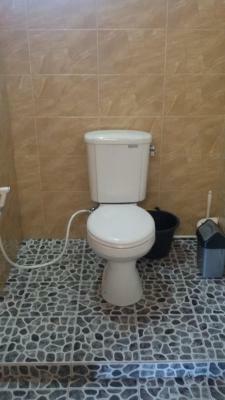 This 1-star guesthouse offers room service and free WiFi. Rooms come with a terrace. 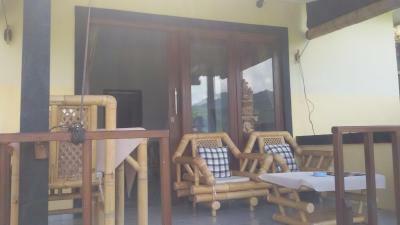 At the guesthouse, the rooms include a balcony with a mountain view. 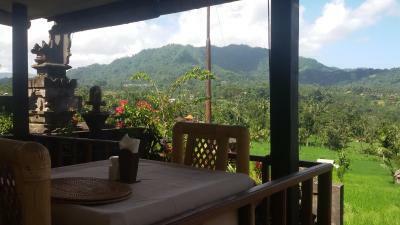 Bukit Luah Sidemen has some accommodations that include garden views, and the rooms come with a private bathroom and a desk. 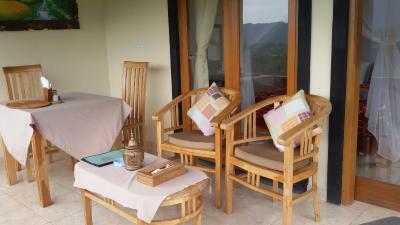 All guest rooms at the accommodation are equipped with a seating area. Guests at Bukit Luah Sidemen can enjoy a continental breakfast. 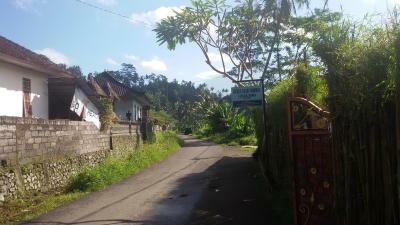 Guests at the guesthouse will be able to enjoy activities in and around Sidemen, like cycling. 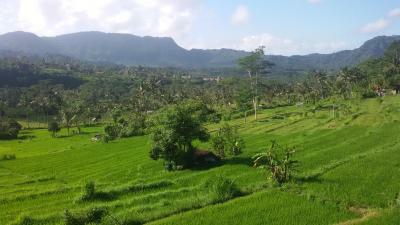 Ubud is 24 miles from Bukit Luah Sidemen, while Sanur is 28 miles from the property. 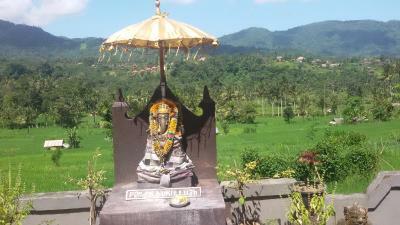 The nearest airport is Ngurah Rai International Airport, 37 miles from the accommodation. This property also has one of the top-rated locations in Sidemen! Guests are happier about it compared to other properties in the area. 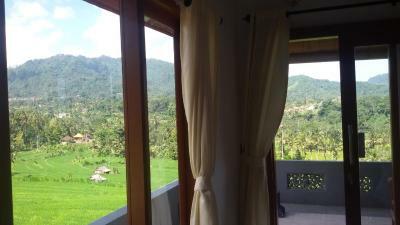 When would you like to stay at Bukit Luah Sidemen? House Rules Bukit Luah Sidemen takes special requests – add in the next step! Bukit Luah Sidemen accepts these cards and reserves the right to temporarily hold an amount prior to arrival. 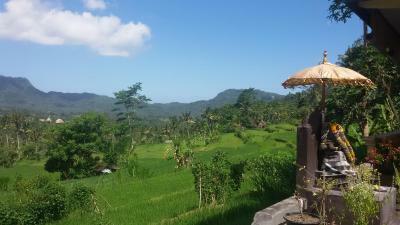 The location was absolutely amazing, in the middle of the ricefields and we felt like the only tourists. Amazing sunset while having a lovely indonesian dinner. 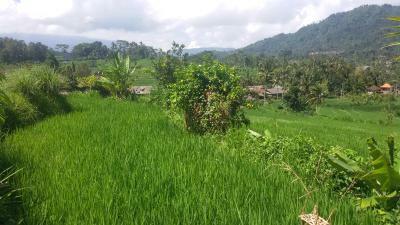 The staff was super helpful and really kind, we got good recommendations for hiking through the ricefields! It was overall amazing! This place was absolutely magical. 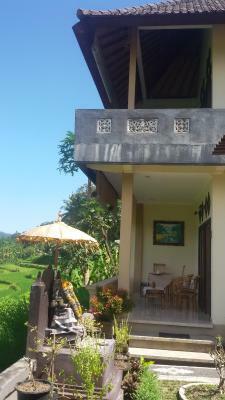 So peaceful, stunning views, wonderful host, delicious breakfast and clean and spacious accommodation. I couldn’t recommend this place more, it was perfect. 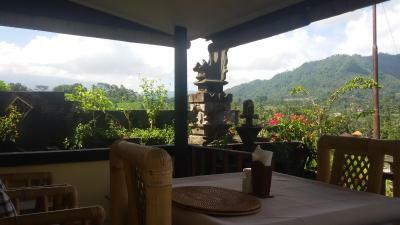 The view is magical, so beautiful .. the breakfast is perfect and you can also have lunch or dinner.. scooter rental available in the homestay..
Sidemen is a beautiful area. The room was really clean and comfortable. 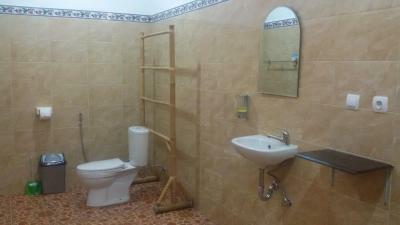 Massive bathroom. 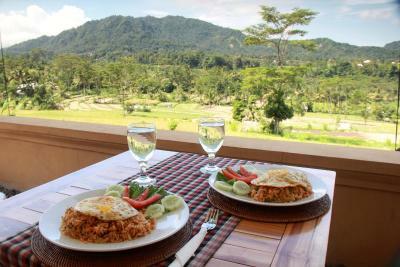 The balcony overlooks the rice paddies and your breakfast/dinner is served there. A good selection on the menu and is delicious. We liked it so much we stayed twice! Howling temple near, but only 5 minutes a day, so not scary. It helps to awake in 6 o clock to see amazing sunrise. No negative, we liked everything. 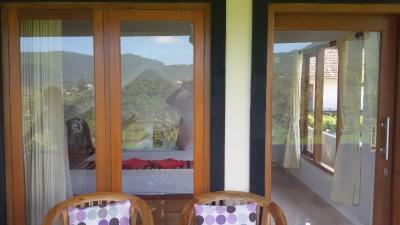 Amazing view trough two panoramic windows and terrace. Great privacy, nobody is walking around. 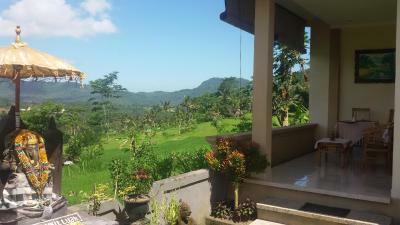 Best climate - 300 m above sea level - not hot, not cold, you dont need aircon, you even can freeze at night if forget to close a window. Fresh air is much much better, then aircon, we had our skin become more healthy, and the room and bath are always good ventilated. Variety of cheap food here. Indonesians are not so annoying like everywhere. Normal hot water. There's a foam mattress and I'd prefer a spring mattress, that's my only very minor comment. Love the view, the room is big and spacious. Huge bathroom. Lovely shower. Staff friendly. Great food. I didn't like to leave and I'm coming back for sure! Everything! 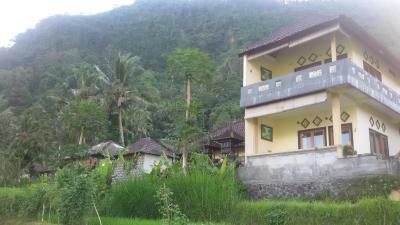 This is the most amazing, wonderful, beautiful place we have stayed in, EVER! 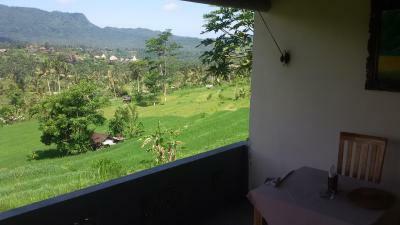 From the staff, the view, the comfort of the room, the cleanliness and the size, literally everything is wonderful! The food is delicious too and the whole set up of the place is beyond welcoming. 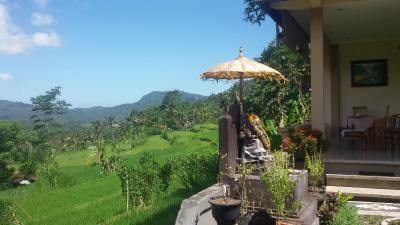 Shows you the true Bali, away from all the nonesense, Gede and his family were the perfect hosts❤️ Thank you so much and we will be back very soon!! 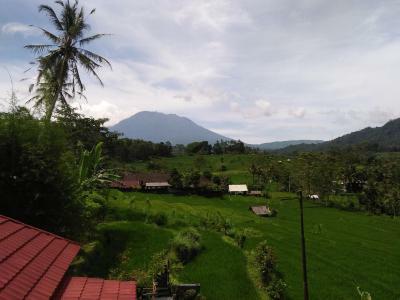 It is slightly far from things but you do get the whole local experience which is great and they have mopeds you can rent as well as a taxi service so it’s fine. 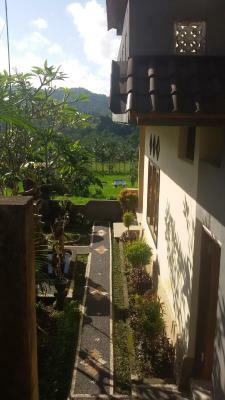 Beautiful location with stunning views looking over the rice fields and loads of greenery. 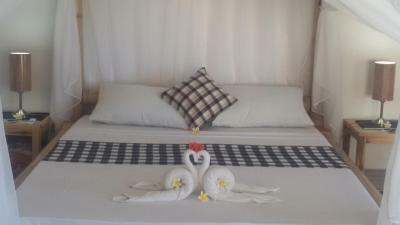 The rooms are clean and they provide you with bed nets as there are quite a lot of bugs in that area. The food is very well cooked and the chicken sate is lovely.